Annabel has been asking me if she can dye the ends of her hair for over a year, ever since she saw some YouTube video about how “easy” it is to dye your own hair. I’ve resisted allowing it, partly because I thought she was too young, and partly because I thought it might open a can of worms. But much to Annie’s delight, I have finally given in. 1) She had to improve in a few areas on her report card. 2) She had to remember to feed Schuyler every day. 3) She had to be a good teammate who tried her hardest at every practice and game. I also told her that the dyed portion of her hair would have to be cut off before school started…mostly because that’s a school rule, and also because I wanted to limit just how much she dyed. She agreed to the terms, and she worked hard to earn her reward. I was very proud of her! Last week was the big day. I took her to the salon where my friend, Lauren, works. Could I have done this myself? Probably. But I also knew that her hair would need to be bleached for the color to be noticeable, and I was afraid I’d mess that up! I wanted a professional! I warned Annie that it would be a long appointment. And it was, over two hours. She handled it like a pro. It took a lonnnnng time to bleach the color out of the ends of her hair. It looked kind of cool when it was all bleached. After Lauren dried the ends of Annie’s hair, she painted on the purple. The whole time Lauren was applying the purple dye, Annie was squealing with glee. And she couldn’t even see it! But she was so incredibly excited, it was really cute. But she was even cuter once the dye was washed out and she finally caught a glimpse of the purple in the mirror. 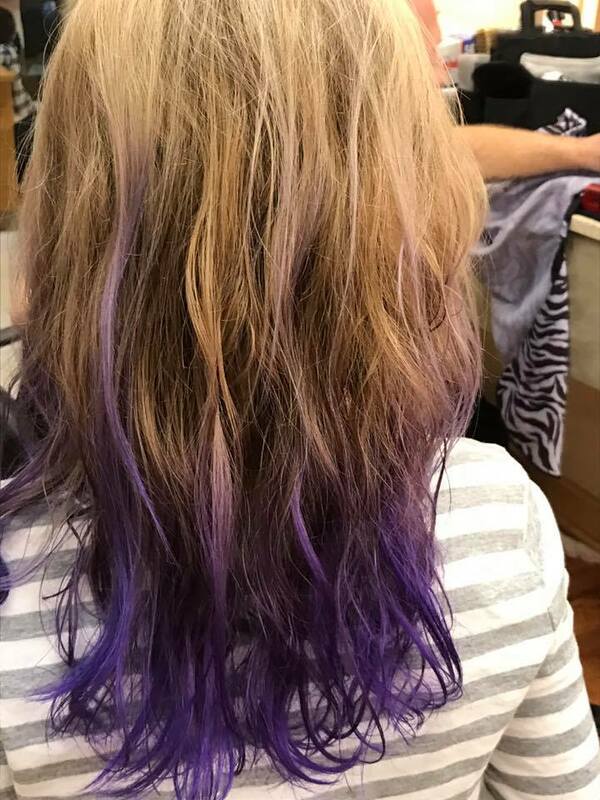 It looks awesome – the purple is still dark enough that it almost blends in with her hair, although I’ve told her to prepare for it to fade into a lighter violet. One unexpected bonus to the dyed ends? Annie is now VERY interested in brushing her own hair! If I’d known that would happen, I might have let her dye her ends sooner! Well it was bound to happen. She’s only living up to her name! Looks fabulous. It looks great, Annie! When I decided to let my hair go gray, I also started streaking it with different colours, but I just do either spray on or swipe on so they wash out after a few times. Sooo cute Annie!! And I love her shirt. I love how y’all parent. I know she’s learning how to work hard towards her goals and earn things! 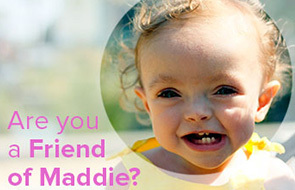 It will help her develop a sense of determination and a strong work ethic in the long run. SO CUTE!! I love how she earned it, too. Good job, Mama! I am loving this so much!!! Awe, Annabel Violet is Violet!!!! I love it & her pure joy! Also love your rules and “you’ve got to earn it” attitude. She’ll appreciate it even more that way! She looks adorable! Enjoy going Violet this summer, Annie!!! Next to me in my last salon visit was a young girl getting her locks dyed and her mother, a stylist, was doing it but there was no bleach. Does color not take on brunettes? Color doesn’t show well on dark hair and will just blend in unnoticeable, especially lighter colors. The best result is on bleached hair. Love it! When it’s school time you may be able to re-dye the tips magenta and it will look gorgeous and blend right in with her dark hair. I did magenta highlights once and you could only see it when the sun caught it. So fun! I resisted allowing my daughter for so long – but now she is 19 and changes her hair color monthly. She is a great kid and her hair is how she expresses her individuality. It is a fun, non- permanent way for kids to express themselves ?. Annie looks fabulous and her smile is awesome!! So cute! Thanks for sharing your fun life stories! How fun for her! I love that she had to earn it. When I graduated from college I finally had a free summer (without classes or work) to dye the tips of my hair a bright blue. I kept it all summer through a family vacation and a cross-country move and then cut it off right before I started my first teaching job. Also, I love her shirt! Love Love Love!!! It looks so awesome. She has hair like my daughter, so thick! My daughter had been begging the same thing–but wanted PINK! Well, two weeks ago while I was at work–dad it it for her. I was going to do streaks, but he did it all–it is much brigher on top and definitely fading on the ends. She has 5 weeks before school starts, so she is going to have to start washing more–she can’t have “unnatural” colored hair at her school. Luckily, it is semi-permanent and we didn’t bleach it first. My 8 year old has brown very tight curly hair. i don’t want to bleach it because cutting it off isn’t an option really. Short curly hair on her turns into Afro hair. Cute when she was 2, now so sure it would be now. I bought some semi permanent dye and colored it last night l which worked decently and was supposed to last 8-10 washing. I figured we’d get maybe a week out of it considering she swims every day at summer camp. I pick her up today and the blue has pretty much completely washed out, womp womp. I told her I will do it again Friday so it’ll last the weekend at least without swimming. Annabels hair looks great, so jealous of it!!! Oh awesome! I actually have some Manic Panic purple just in case this color fades faster than we’re expecting! I love this! Her hair looks great, and her excitement is adorable. You guys are so fun. It lasted a couple of months. I’m so sad to see Heather (and others in the comments here) mention that their kids’ schools prohibit “unnatural” hair colors. What a bummer!! I know. I don’t like it, but considering the school is very lax on the dress code issues that plague other schools, I figure it’s a small price to pay. I’m so bummed that Garnier discontinued the temp color that we like. It’s like a liquid chalk but showed up great on my daughter’s brown hair without having to bleach it. Annie’s hair looks adorbs!